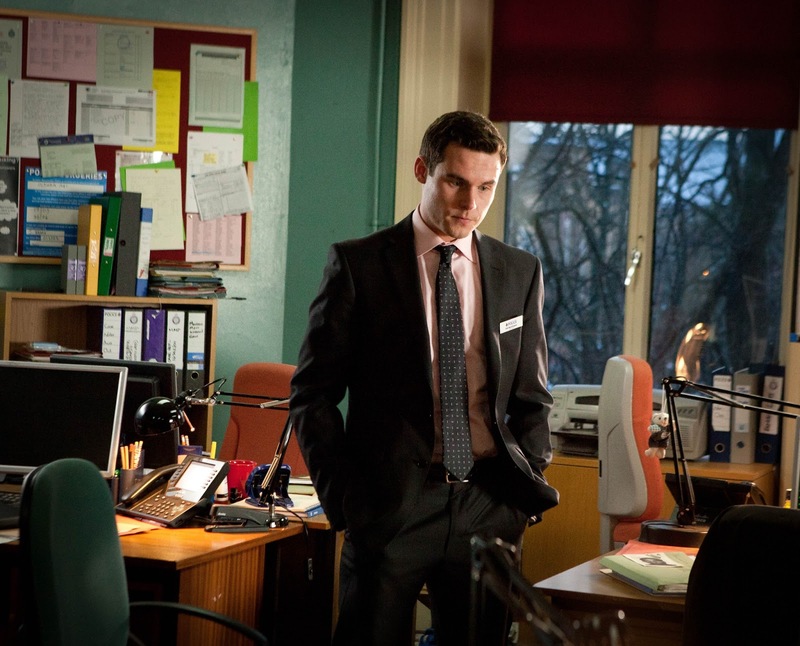 ITV have released a clip of former Emmerdale actor Danny Miller in his new role in Scott & Bailey. Miller joins the popular crime drama in episode 4 of the current series. Danny Miller was thrilled to join the cast of Scott & Bailey even if both he and his character were thrown in at the deep end. The former Emmerdale actor, who also recently starred in ITV drama Lightfields, plays new boy Rob Waddington, a fast-tracked detective sergeant heading for the top. But his arrival at Syndicate 9 co-incides with a major murder investigation set to make national headlines. Stockport-born Danny spoke to one of his friends who works in a real life police Major Incident Team (MIT). “I talked to him a lot and he offered as much help as he could. I also watched various documentaries about how a police briefing room would work. Known to millions as Emmerdale’s Aaron Livesy, Danny left to pursue new acting challenges, including the role of Tom in Lightfields and now D.S.Rob Waddington. Rob is the son of former detective Frankie Waddington, who once worked alongside D.C.I. Gill Murray (Amelia Bullmore). His appointment to the team comes after Janet Scott (Lesley Sharp) has spent months filling the gap as Acting Detective Sergeant. And while Rob is a high-flyer, he also needs all her help and experience to guide him. Explains Danny: “Rob is young and determined to sail through the ranks. He was only in uniform for a short time and quite clearly he’s been fast-tracked to come into this more senior role. Did it help that Danny was also a “new boy” coming in to join an established regular cast? “Absolutely. It almost had that first day at school feeling about it. I was sat there among all these well established actresses and actors and my character is telling them what to do. “Although I’m acting a character, it was very easy to fall into that intimidated role. But Rob knows that at the end of the day he is the boss and he has to do it. He’ll do what he’s got to do. “I’ve been in the situation back with Emmerdale. It is very hard for a new actor to come in and instantly feel a part of that cast. We used to have a lot of new families joining and everyone tries to make them feel as welcome as you can. “But you can’t help that feeling that you’ve invaded, in a sense, because these people have been working together for three years and they know the characters inside out, who would say what to who, who would sit where and who would do what. “I could only research what I could about the police and do what I wanted to do with Rob. But as the director said, ‘It’s rank over age.’ It’s not the fact that at 25 he’s half the age of most people there. That’s the job. He’s got to tell these people what to do. Rob is impressed when he observes D.C. Rachel Bailey (Suranne Jones) interviewing a murder suspect. “I imagined Rob to be sat down aged nine or 10 when his mates are out playing on the park, he’s sat down watching The Bill or another police series because he’s so excited and thrilled by it all. Danny is a relatively new convert to Scott & Bailey. “I was intrigued by it but hadn’t seen a lot because of work. But I downloaded the series to my iPad from iTunes and watched it all during breaks in filming for my last job. “I instantly fell in love with it - and that wasn’t a biased opinion because I was going into the series. It’s a great show and I love the writing. Danny grins: “He does have that feel about him. My own mum has said, ‘Oh, I just want to mother him.’ I could sit down and have a cup of tea with Rob and tell him all my problems, knowing the secret would be safe. When Scott & Bailey fall out later in the series, Janet finds that she can confide in the young man as a friend. “That scene is so beautifully written,” says Danny. “When we sat down and discussed it we said, ‘This is almost a mirror. It should be the other way around - the young one confiding in the older one.’ But it’s so clever the way they’ve done it. Is it an added bonus that the production is filmed in and around Manchester, where Danny is based? Although still working hard to tight deadlines, the pace of filming on an eight-part drama is necessarily different to that on a year-round soap. “We were doing 60 pages of script a day at Emmerdale for scenes that are shown five days a week, Monday to Friday. So you’ve got to expect to film that much. Could Danny see himself doing Rob’s job for real? “If I was going to be a policeman I would probably be a sergeant because they have a lot of pressure on their shoulders but don’t have to do any of the interviews - they are done by detective constables. Rob begins to get to grips with his new job in episode six, which involves an investigation into a suspicious care home death. “It’s a topical story of things going on behind closed doors. Reading the script I was intrigued to discover the outcome. Danny became a very recognisable TV face during his time in Emmerdale. “It was really full on around the time of the outcome of the gay storyline. There were times when I couldn’t sit in a restaurant without someone saying something. Which was fine. I could deal with it and it was no problem. Danny’s arrival as Rob on screen in Scott & Bailey is certain to change that again. The cast did their best to help him race ahead with another role - as part-owner of a National Hunt racehorse. Danny is also co-founder and chief ambassador of Once Upon A Smile, the charity set up after the death of his friend and former Emmerdale producer Gavin Blyth from lymphoma cancer at the age of just 41. The charity’s recent annual Grand Ball in Manchester was attended by over 500 people despite snow and freezing temperatures on the night. “The success of the charity has been immense over the last 12 to 18 months. It means a lot to me because it’s close to my heart with Gavin and the Blyth family. So I keep a close eye on what is happening at the charity - a hands-on approach. “So many families that have been hurt have been able to smile again and we’ve been able to help in different situations. Danny Miller Joins the cast of Scott & Bailey from Wednesday 24th April at 9.00pm on ITV.